The following exhausting! 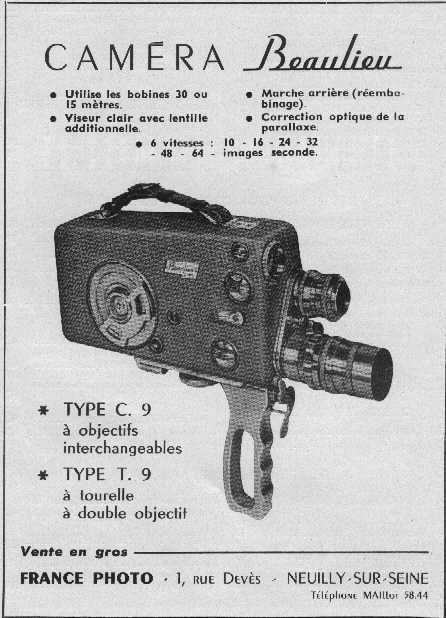 but probably not exhaustive list of 9.5mm equipment doesn't include items from Pathé or Pathéscope which are catalogued separately. 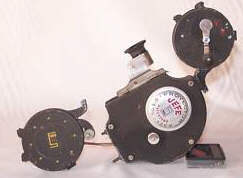 One-offs, privately made, or conversions, are generally not included. 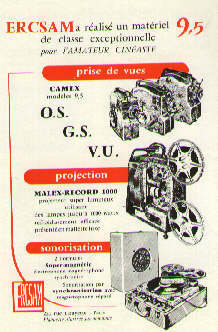 These lists just show cine cameras and projectors, naturally there were various accessories like spools, cans, splicers, film viewers, exposure meters, projection screens and the like, made or supplied by many of the companies listed and other smaller firms - these are not included here, but are now on a separate list. Where you see a blue underlined hyperlink, click on it for an illustration or a full illustrated article. You may need to return to this listing by clicking on 'back'. 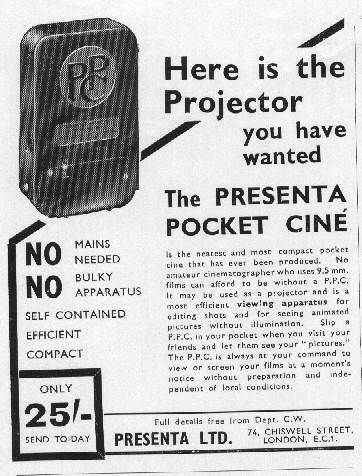 If you know of other 9.5mm cameras or projectors, an e-mail with details would be much appreciated! 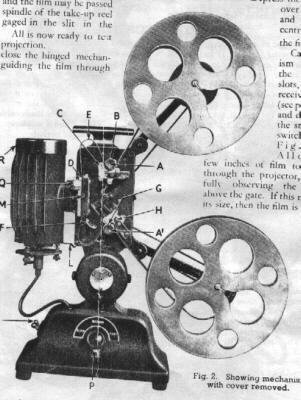 Unless stated otherwise, all the cine cameras listed were clockwork driven and the cine projectors often took 120metre / 400foot spools. Although listed here, not all the items were actually on sale in the UK. 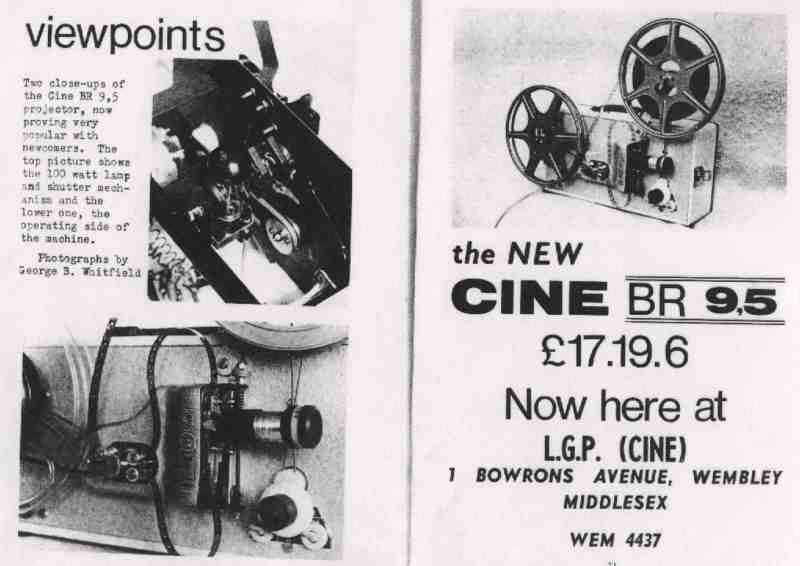 Many if not all of the companies produced cine equipment in the other 'home movie' film gauges but only 9.5mm items are listed here. The company names & addresses detailed in these lists applied when they were trading; few, if any, exist today. Sorry about the quality of some of the pictures - when time permits they may be improved! Dates are only approximate and have usually come from magazine adverts, reviews, trade announcements etc. 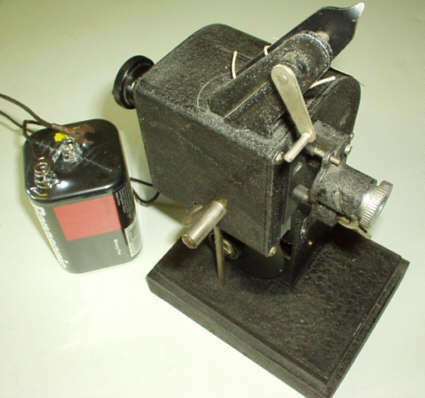 Many of the simpler projectors, little more than toys really, often used a low voltage lamp, perhaps just 6 to 10 watts, fed from the 230 volt AC mains supply via a dropper resistance, normally in a separate ventilated black box. These were electrically quite dangerous even when new, but today with perished and cracking wiring they really are lethal!! 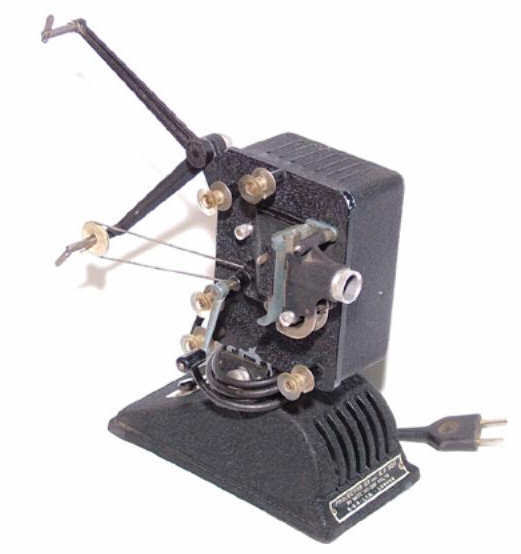 If you are going to get these simple machines in working order, use a modern type QI lamp like a 6volt 10watt M29 and feed it from a proper mains transformer and ensure everything is earthed for complete safety! I have recently experimented just using an LED (light emitting diode) lamp cluster from a cheap tiny torch in the Astor and Bingoscope machines - this is fed from a small battery and gives results probably brighter than the original lamp, virtually no heat and electrically safe! 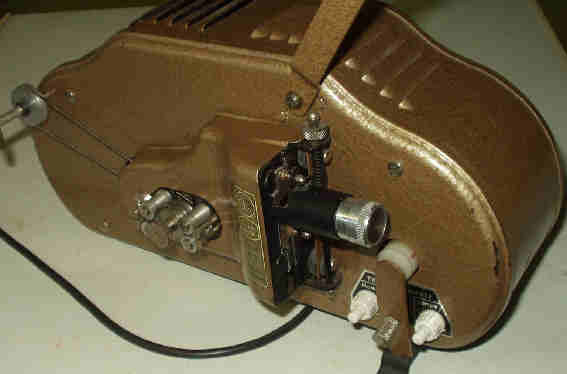 If you are running a better quality vintage projector from the mains, plug it in via an Earth Leakage Trip adaptor device (as used in the garden for electrical tools) - these cost under a tenner and could save your life! Remember that much of Europe had 110 volt electricity supplies, so do avoid connecting 110 volt equipment directly to our UK 230/240 volt AC mains supply!! 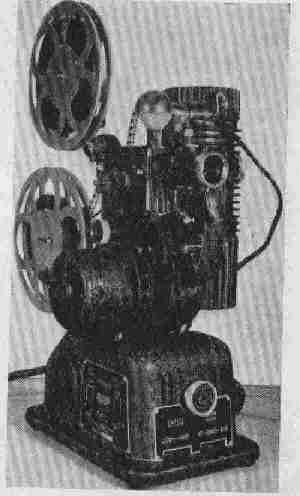 Just come across this photocopy from a magazine - a cine projector - but what make is it please? 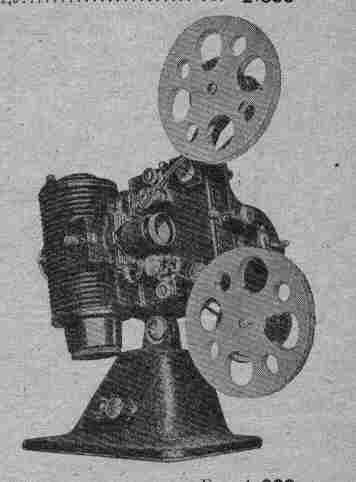 The spools mean that this is a 9.5mm cine projector - artist's impression - the sprocket doesn't seem to have any teeth! Certainly a decent size, motor driven, pilot lamp, maybe 500 watt lamp, so doesn't come from the toy class. Currently I have no idea - maybe Elmo or Sakurascope from Japan, perhaps Germany or Eastern Europe - probably 1930s (judging by the Pathé spools), but artist signature is dated 1948?. *'MICKEY MOUSE' BILCIN 187 PROJ. - GER 1934? - Colour box with Mickey Mouse theme, barrel shutter, 30/60ft cassettes, battery lighting MES lamp, hand turned. *BILCIN 186? PROJ. - GER 1934? 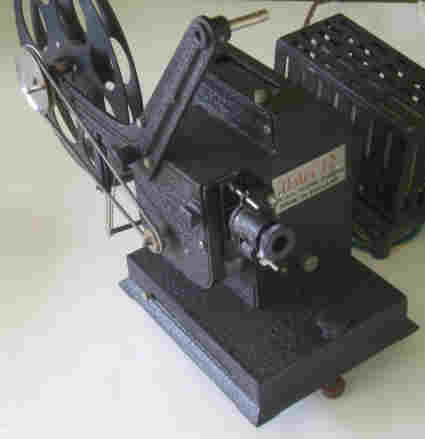 - Black pressed steel, gate,claw, gearing similar to model 187, 30/60ft cassettes, provision for lantern slides. 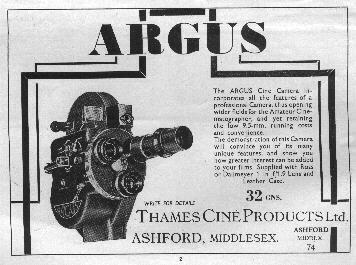 ARGUS CINE CAMERA - GB 1936 - 100ft spools, triple lens turret, vari-speeds, backwind etc. 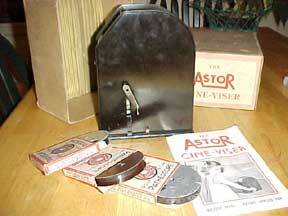 *ASTOR CINE VISER - GB 193? 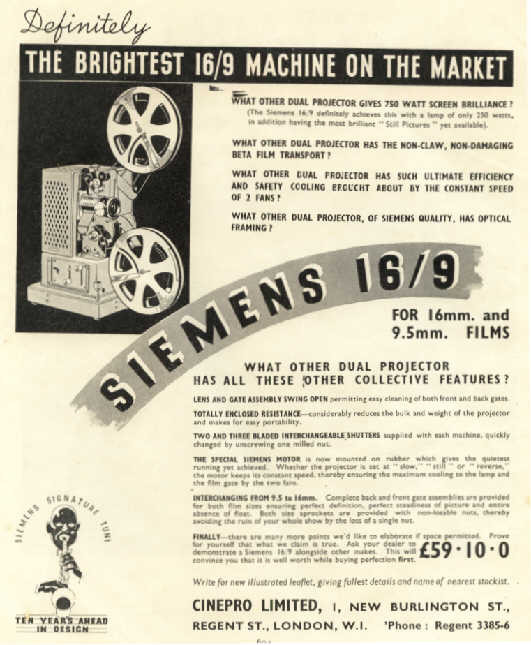 - Not a projector, just a viewer but quite rare these days - intended just for 30ft and 60ft films on spools - battery powered torch bulb illumination - quite adequate, but small 2 inch image. 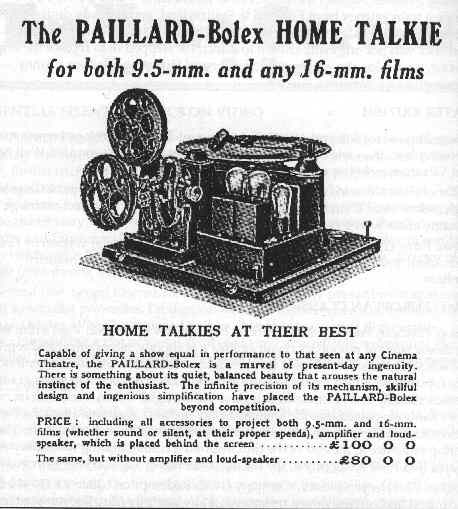 Contained in largish bakelite housing so not suitable for use as an editor. Just found one at last! July 2012 - thanks so much to Trevor Adams for the copy of the instructions! Probably late 1930s as I think this example was bought around 1940 - box is price marked at 59/6d (just on £3). 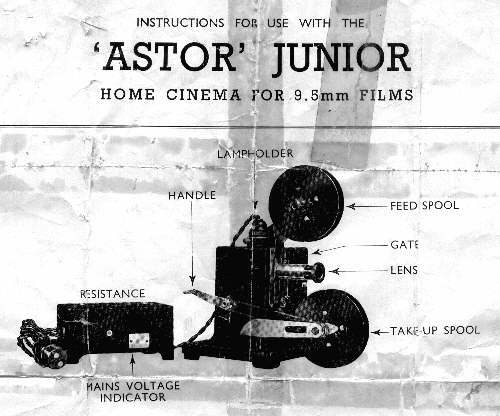 * ASTOR JUNIOR PROJECTOR - GB 194? 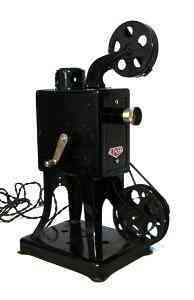 - Small toy projector, die-cast body, 60ft spools, 24volt 6watt lamp - resistance fed from mains. Mechanism (Pathescope Ace copy), seems similar to Homray. 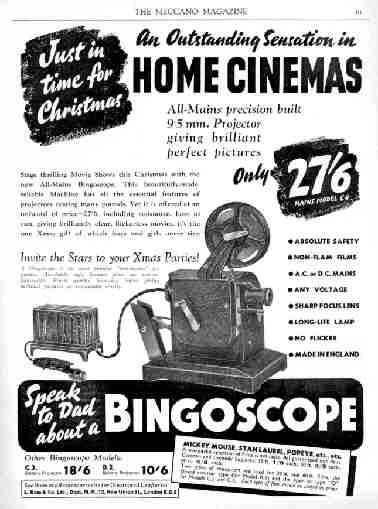 * ASTOR 22 PROJECTOR - GB 1947 - Mazac die-cast black finish body, 16volt 8watt MES lamp fitted at rear, motor drive, 300ft spools - review ACW March 1947 - virtually the same as the Bingoscope C5 and Hunter listed below. 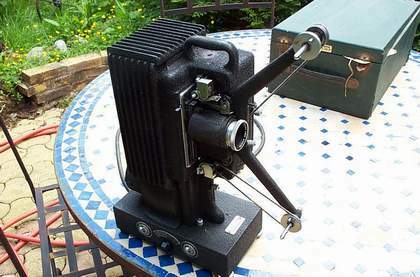 * ASTOR 33 PROJECTOR - GB 1947 - Mazac die-cast black finish body as Astor 22 above. 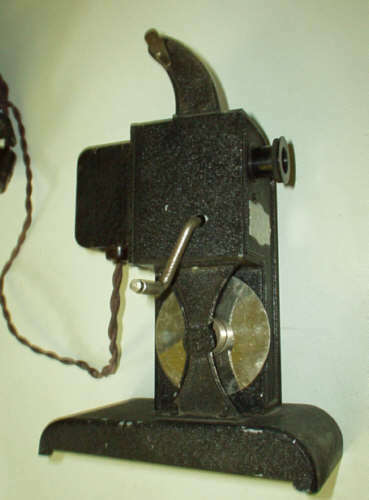 Lamp (in a small bayonet mount) is fitted from the side. 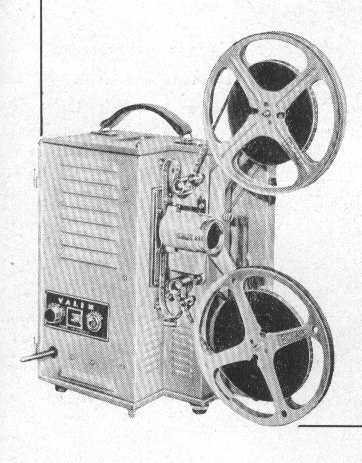 Identical to the Bingoscope C5 and Hunter projectors. *BING BRITISH MODEL 1 - UK 193? 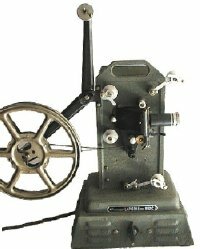 - enclosed 30ft spools & 15ft rolls of film only, fixed lens, models for 4.5volt battery or mains via dangerous dropper resistance! Hand turned or clockwork. 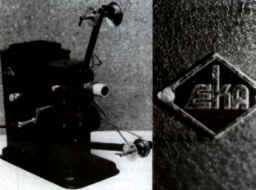 *BINGOSCOPE C1 ? 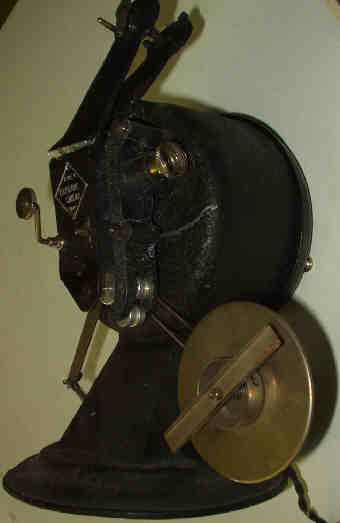 PROJECTOR - UK circa 1934 - closed spools only, hand-turned, mains dropper (approx 730 ohms on 240volt tapping) probably for 12 volt 0.3amp (4 watt) MES lamp, internal film take-up. 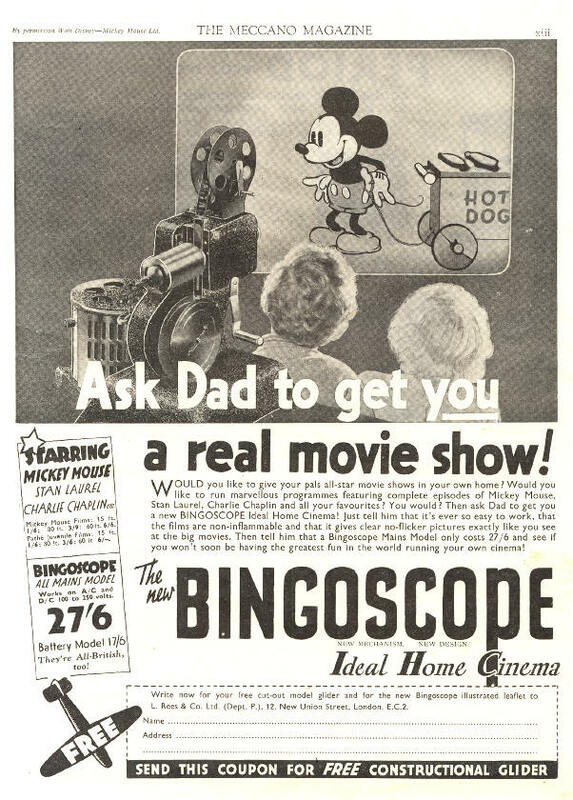 *BINGOSCOPE B2 ? 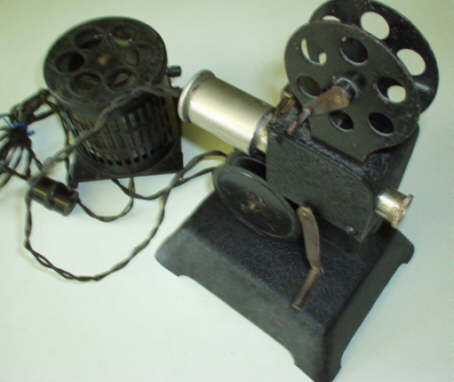 PROJECTOR - UK circa 1935 - closed spools only, hand-turned, battery connections for 6 volt battery? (probably 0.5 amp, 3 watt lamp? 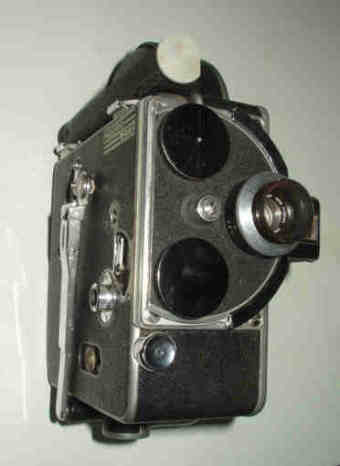 ), internal film take-up, Pathéscope "Ace" type mechanism. 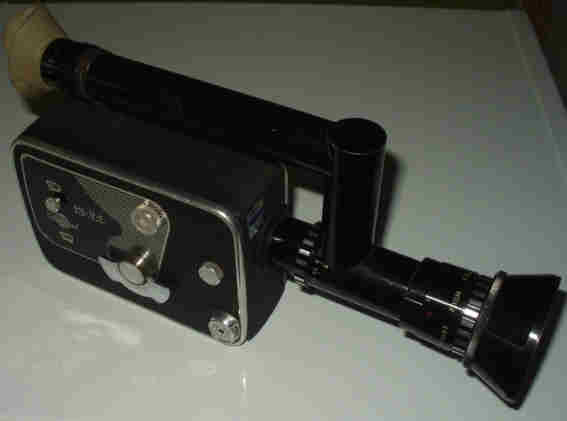 *BINGOSCOPE C3 ? 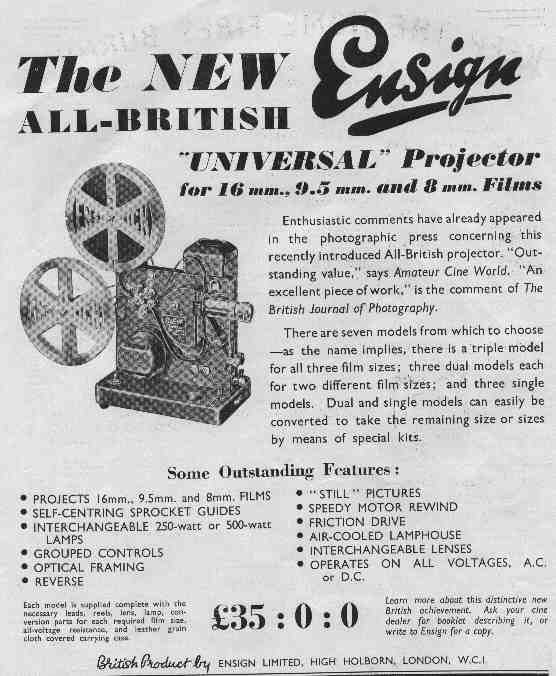 PROJECTOR - UK circa 1937 - up 60ft spools, hand-turned, mains dropper resistance for 12 volt 6 watt lamp?, Pathéscope "Ace" type mechanism, internal film take-up. 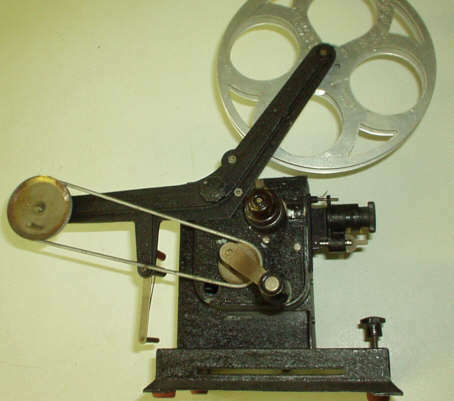 BINGOSCOPE C4 PROJECTOR - UK circa 1937 - up to 60ft spools, hand-turned, mains dropper resistance, Pathéscope "Ace" type mechanism, brackets at rear for film take-up, otherwise similar to the C3 model. 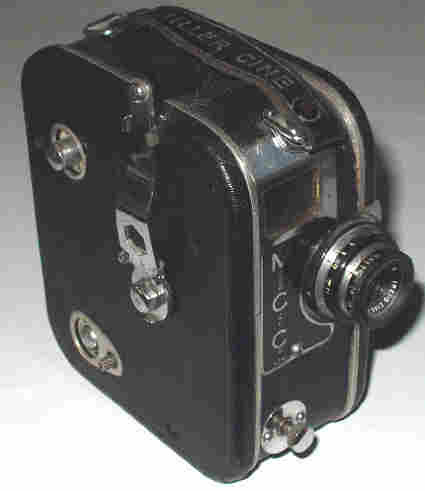 *BINGOSCOPE C5 ? 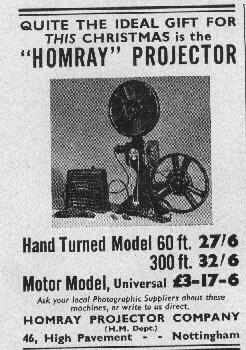 PROJECTOR - UK 1940 - 400ft spool capacity, hand or motor driven versions, no sprockets; distributed by R.F.Hunter as the "Hunter", which was even reviewed in the "Home Movies & Home Talkies" magazine dated July 1940! 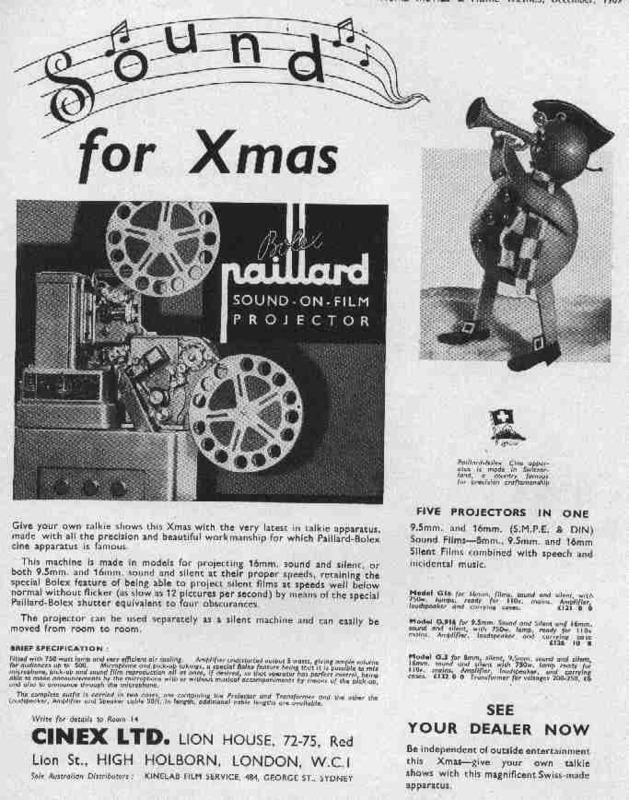 Also later, (1947? 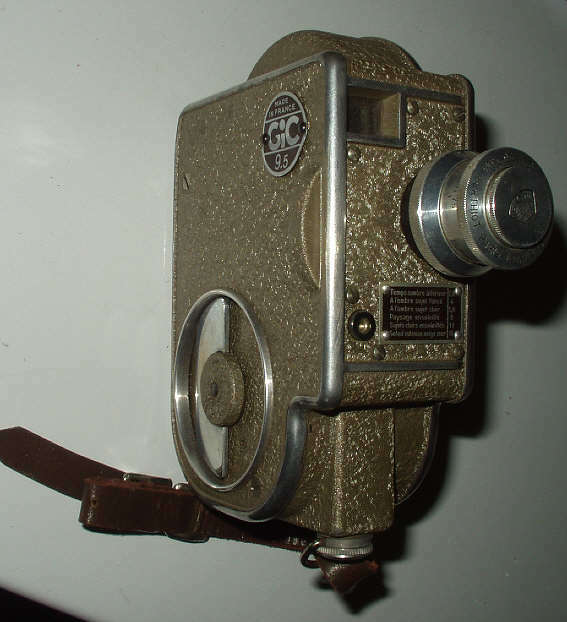 ), sold as "Astor 22" or "Astor 33". 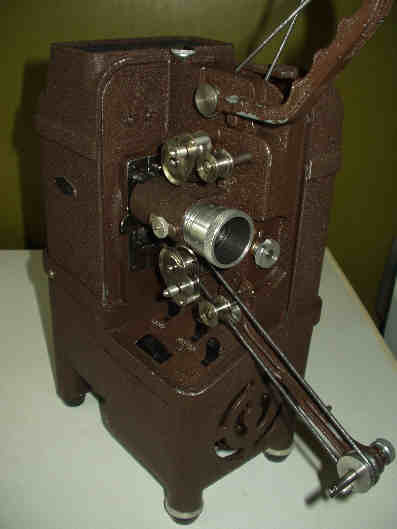 *BOLEX AUTO-CINE PROJECTOR - SWIT 1929 - Dual 16/9.5mm Bols, dual gate sprocket & gate, v.rare! 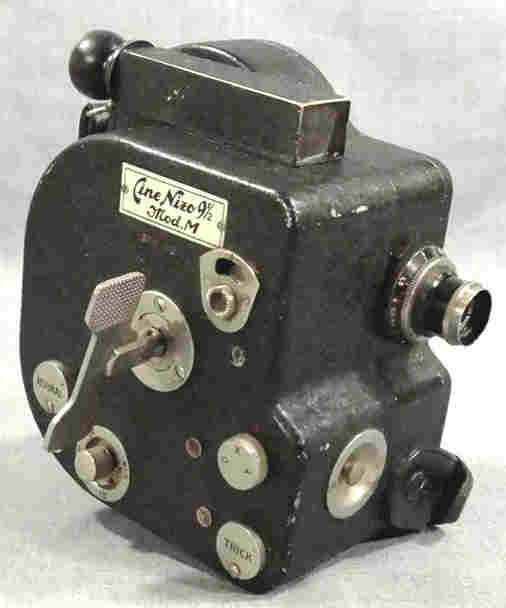 *TYPE 1 CAMERA / PROJECTOR - GB 1935 - "P" charger for filming, 30ft closed spool for projection, simple "dull/bright" setting lens, wire-frame viewfinder, clockwork drive, external battery for special 6volt 6watt bulb., no focussing for projection! Even tiny picture is dim! See July & Aug '35 ACW Typical serial no. 2068. 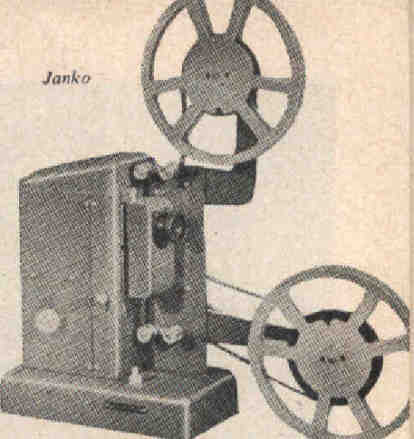 CINAK NO.1 - PROJECTOR - FR 192? 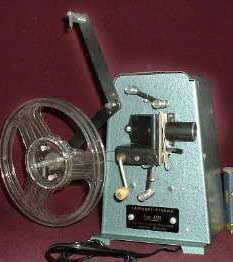 - Hand turned - 30/60ft cassettes & small spools, mains voltage lamp. 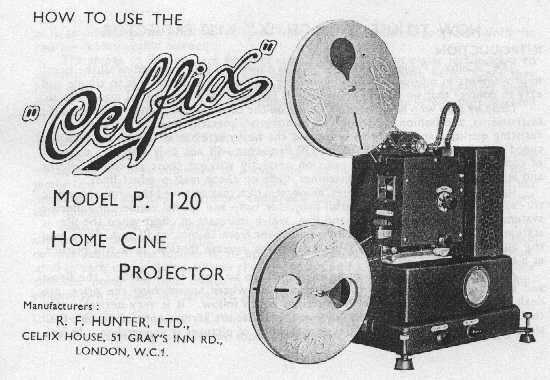 (UK Importer: Peeling & Van Neck Ltd.
PROJECTOR - GER 1929 - Multi-gauge versions, including 17.5mm! Distintive fluted lamphouse. Rare! 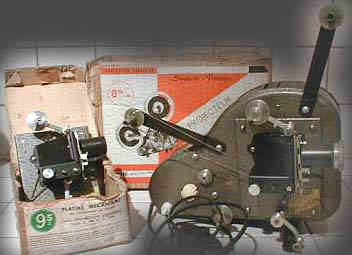 MODEL C PROJECTOR - GER 1931 - 400ft spools, motor drive, sprocket feed/take-up - no further details at present - see photo! 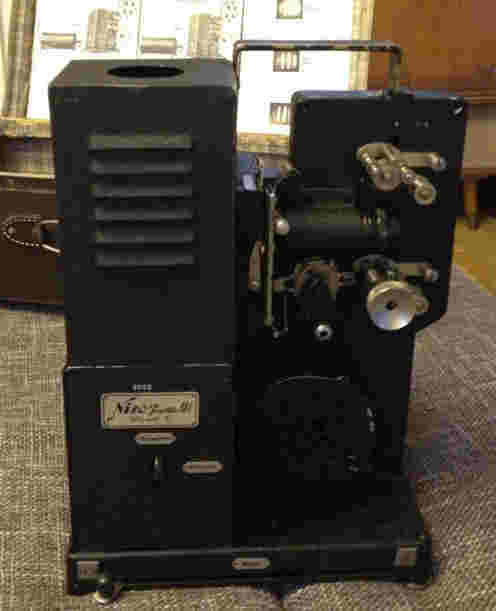 The company Neizoldi & Kramer was founded in Germany around 1925; from then till the late 1930s they manufactured a range of cine equipment in various gauges including the original cine projector which had interchangeable mechanisms for most gauges including 17.5mm. 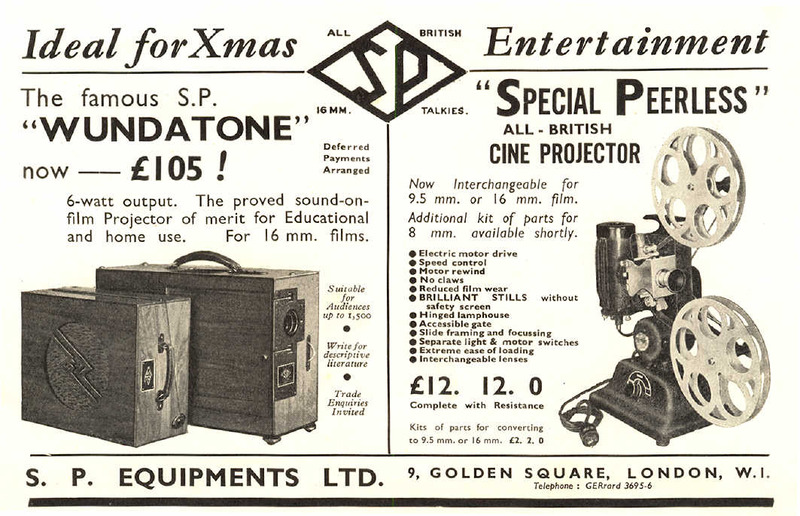 Little of this early cine equipment arrived in the UK. 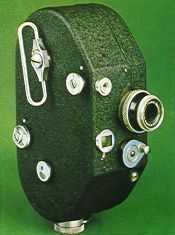 By the 1960s Braun had acquired the Nizo name and began manufacturing quality cine equipment in std 8mm and later Super 8mm. 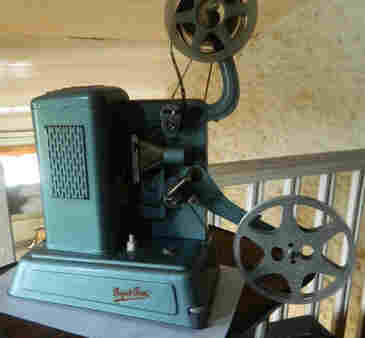 ROYAL 215 PROJECTOR - FR 1950-55? - Grey finished alloy die-cast body, sprockets, power rewind, 115 volt 250/300 watt lamp, interchangeable parts supplied for 8mm; 9.5mm; 16mm. appears similar to the Royal 210 listed above. 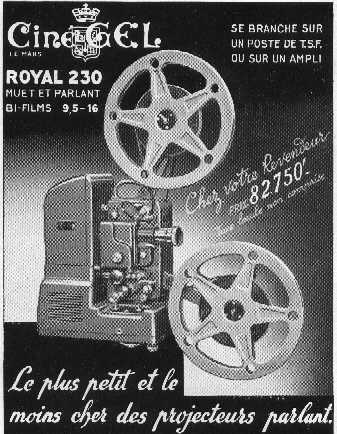 ROYAL 225 PROJECTOR - FR 1948-5? 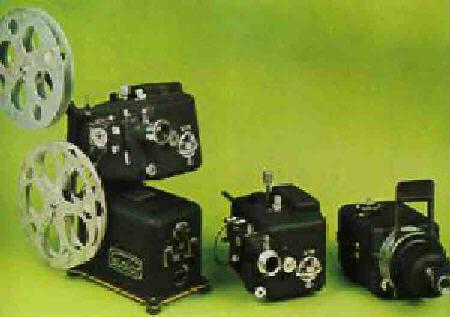 - as the 220 model, but dual gauge 9.5/16mm, stills. 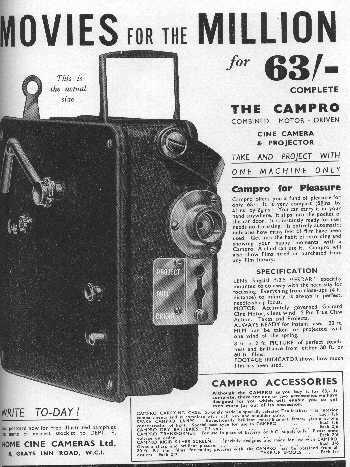 CUMO - SP - 1930 approx. 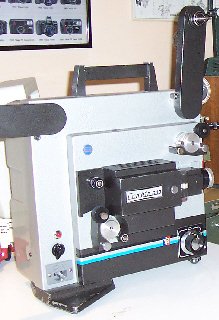 - Designed for running 16mm and 9.5mm notched prints, 300watt 125 volt lamp, 100m / 300ft spools. Spotted by a member of the French 9.5 Club at a fair the Calella Festival. More information gladly accepted! 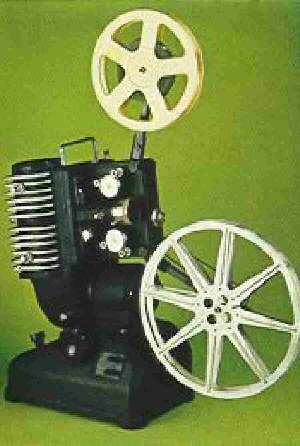 *MODEL 3 PROJECTOR - GB 1935 - Copy of first Coronet, silver lamphouse, handturned, A1/1 50volt 25watt lamp, 30ft & 60ft closed spools, soon 300ft 'super attachment' and motor drive available. 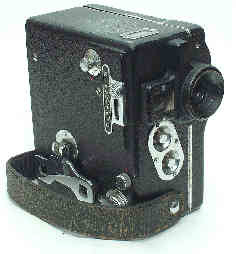 *CAMERA - 2190 - AUS 1936 - 'P' charger film loading, metal body, f2.9 20mm focussing Cassar lens or f1.8 20mm Berthiot etc. - see the general article and photos above, twin filming speeds 16/32fps, aperture/footage counter visible in viewfinder. 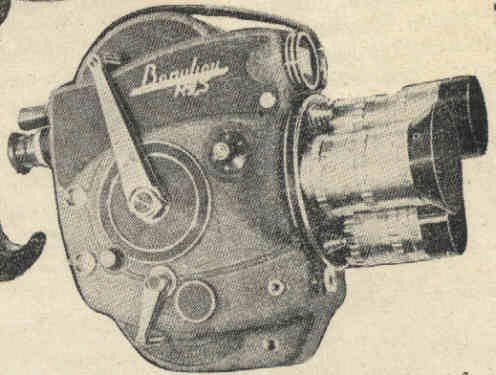 separate detachable handle for still pictures. See July '36 ACW - typical serial number: K3271. 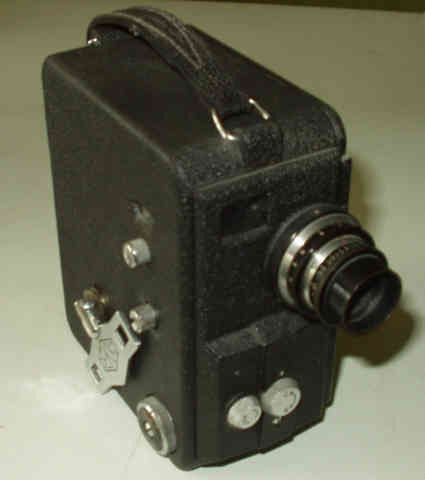 PHOTOCELL CAMERA - 2290 - AUS 1937 - Top mounted bakelite housing with meter, 'P' charger, otherwise features as other models above. 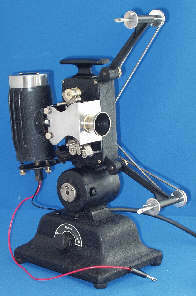 PHOTOCELL CAMERA - 2295 - AUS 1937 - Top mounted bakelite housing with meter, 50ft spool loading, otherwise features as other models above. 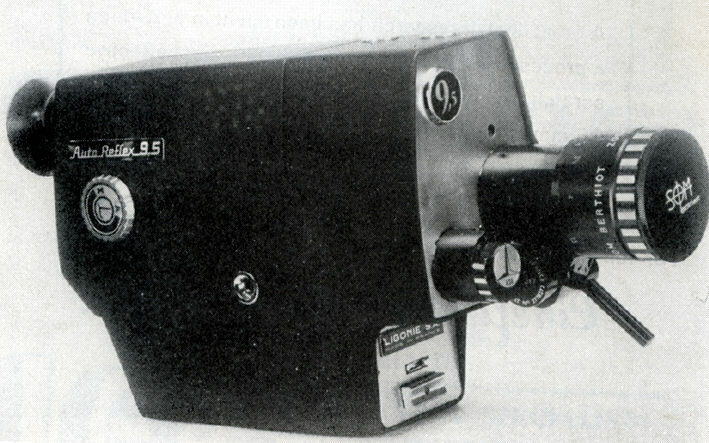 EKS PROJECTOR - UK 1950s ? 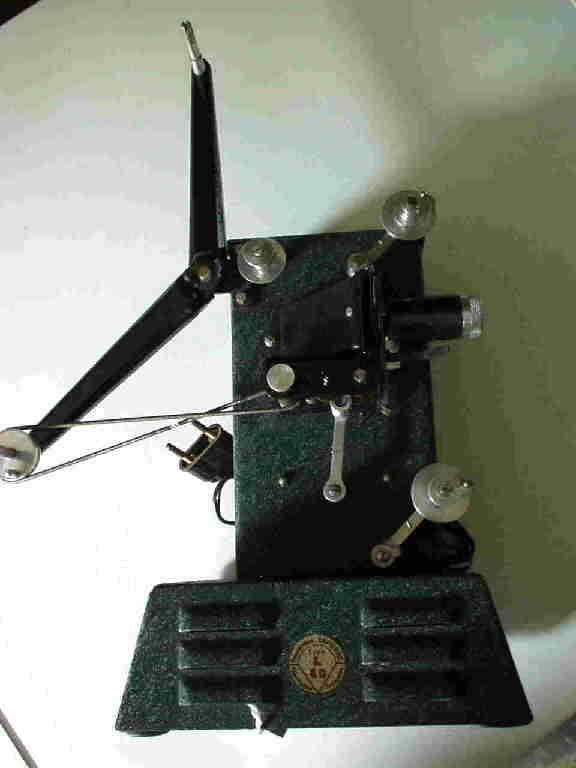 - Simple hand turned machine, 110/220volt, 50watt lamp, looks like Lapierre (France) product or copy. 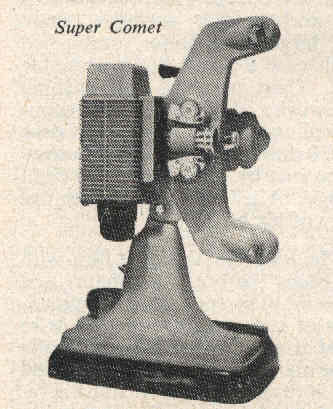 ELMO PROJECTOR - JAPAN 1934/35 - American style with pedestal base, sprockets, motor, stills, 75 volt (later 150 volt) 500 watt lamp via prism, pilot light, room light dimmer, 2" lens. 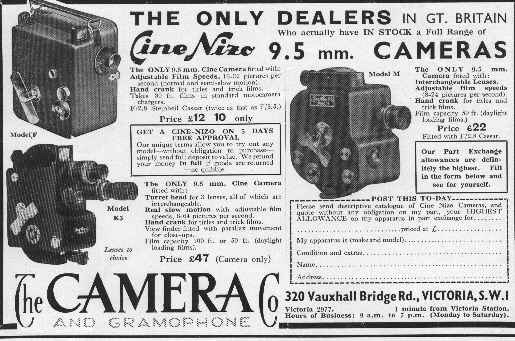 (See ACW review Feb 1935 / HMHT May 1934 & Jan 1935 / Book -The 9.5mm Cinephotographer by Harold Abbott - the importer!) 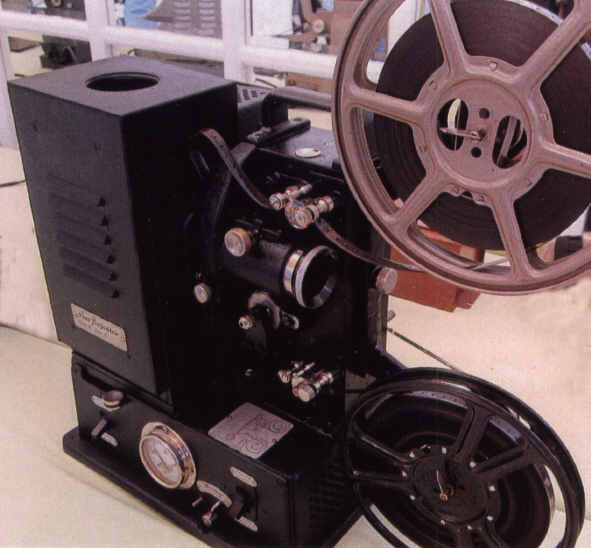 Also a 16mm version. 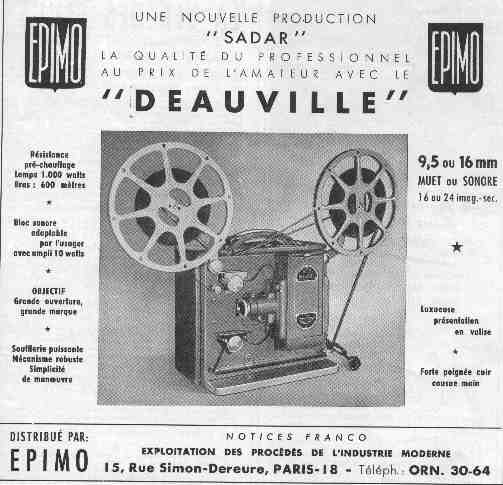 SADAR DEAUVILLE PROJECTOR - FR 1951 - Built into case, up to 1000 watt lamp, 16/24fps, silent or sound. 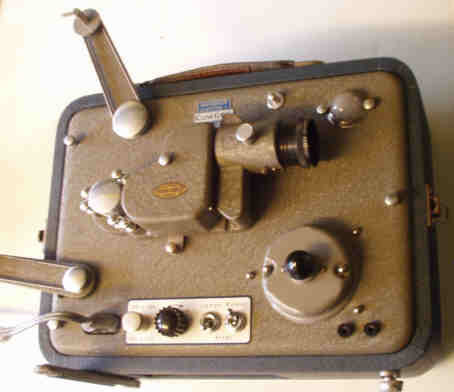 *MINOR PROJECTOR - FRANCE 1948-5? - simple sprocket fed design, side-by-side spool arrangement, 40mm lens, A1/4 100watt pre-focus lamp, 110/220volt, serial no: (inside lamphouse cover) 23 - very weird threading path! 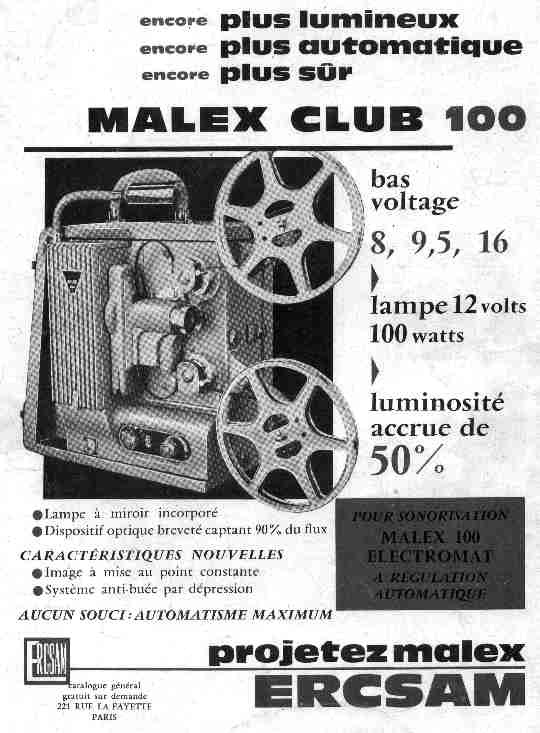 MALEX CLUB 100 PROJECTOR - FR 1960? 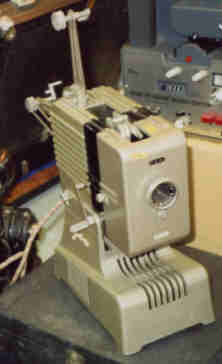 - as Super 100 but 12volt 100watt reflector lamp etc. 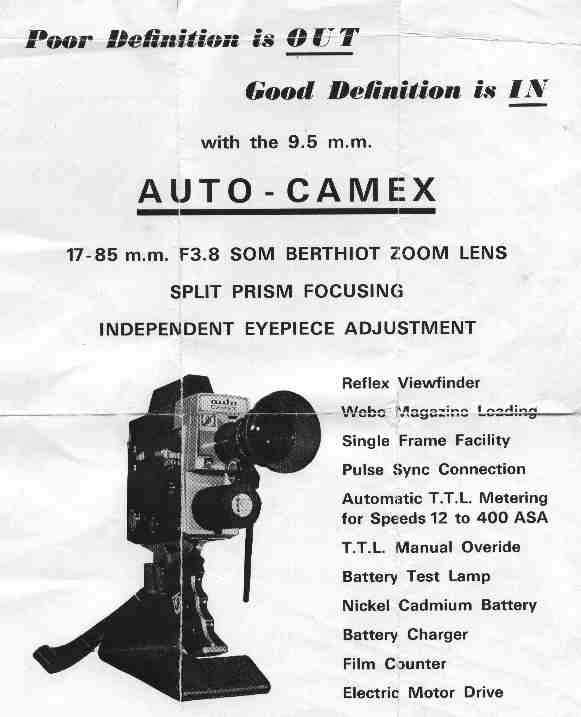 *AUTO-CAMEX CAMERA - FRANCE 1970 - f3.8 Som Berthoit 17-85mm compact zoom with reflex viewfinder, CdS auto-exposure for 12 to 400asa, 16fps electric drive, 50ft Kodak M14 (Webo) magazine loading. 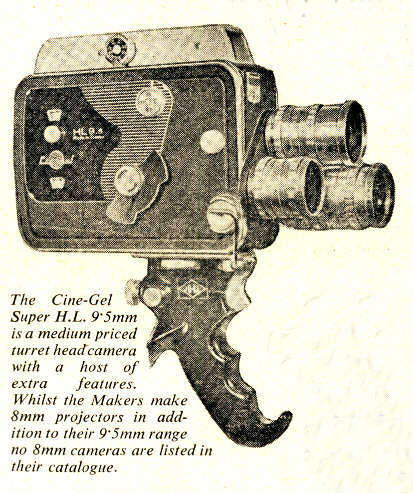 Supplied with pistol grip/trigger release, lens hood and instruction booklet. 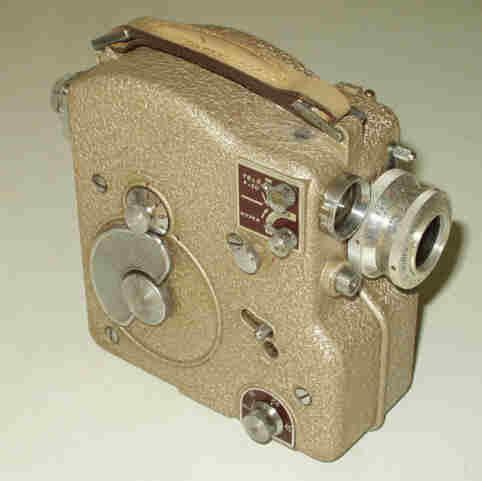 *GIC CAMERA - FRANCE 1950-5? 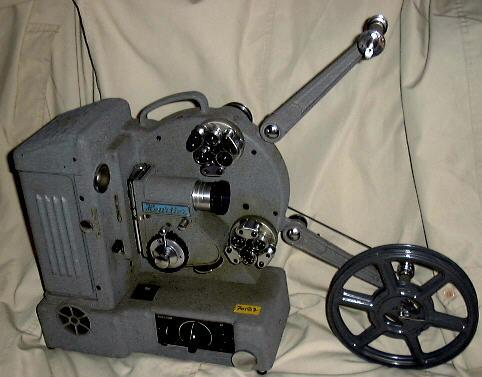 - 50ft spools, sprocket feed, start button threaded for cable release, single interchangeable "C" mount lens, normally f1.9 20mm focussing Som Berthiot, feeler type footage counter (counter window plastic usually goes opaque, viewfinder engraved for telephoto, typical serial number: 20996. 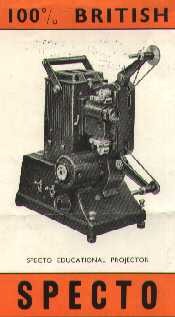 JEFE SUPER - SPAIN 1930s - another simple hand turned machine, up to 15m / 60ft spools? 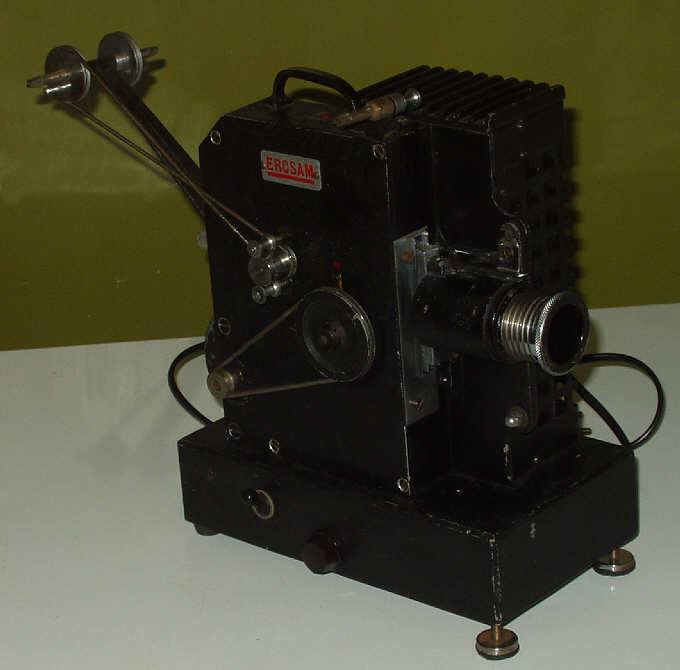 TYPE RL50 PROJECTOR - FR 1950? - No information yet, just the model! 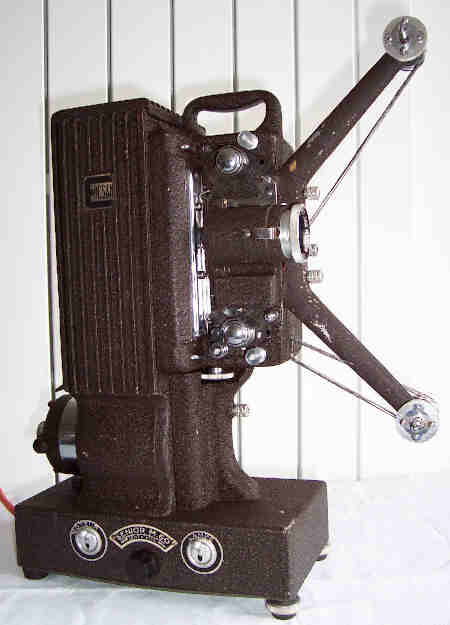 CINE BR LUM PROJECTOR - FR 1965 - Upgraded version with transformer fed 12volt 100watt lamp. 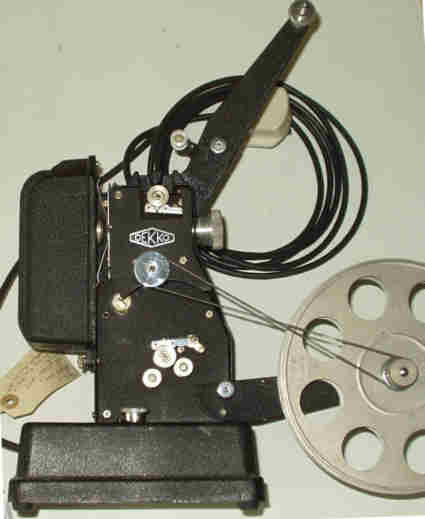 CINE BR EXTRA LUM PROJECTOR - FR 1965 - As BR LUM but with fast rewind. Brighter picture? 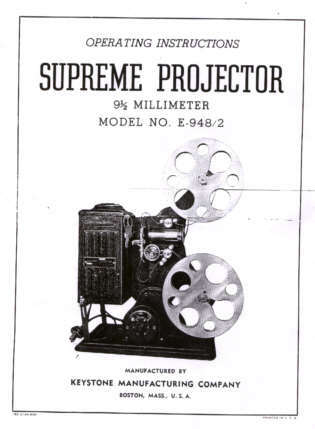 * EUROP 951S PROJECTOR - FR 1968?- 197? 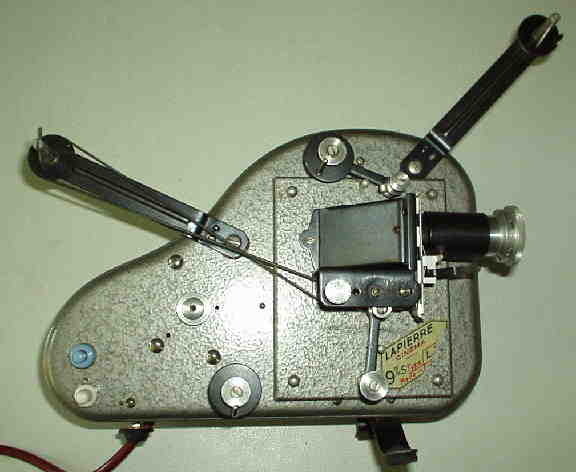 - Version of Pathé Europ using up original parts with some new components, 12 volt 100 watt A1/231 lamp, synchronous motor with fixed 16/24 fps speeds, 1000ft spools, f1.5 Som Berthiot lens in 32.5mm mount, optical framing, badged Europ Super. Typical serial nos: 12323; 12351 (think we can assume last two numbers are production quantities!). Safer to fit three core mains lead! 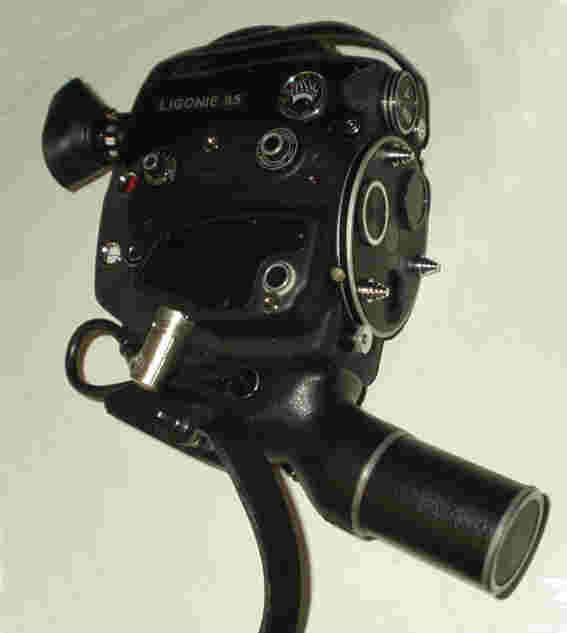 * LIGONIE AUTOREFLEX ZOOM CAMERA - FR - 1967- 197? Auto exp., 50ft Webo mag. loading, electric drive - full review 9.5 Review magazine June 1967. 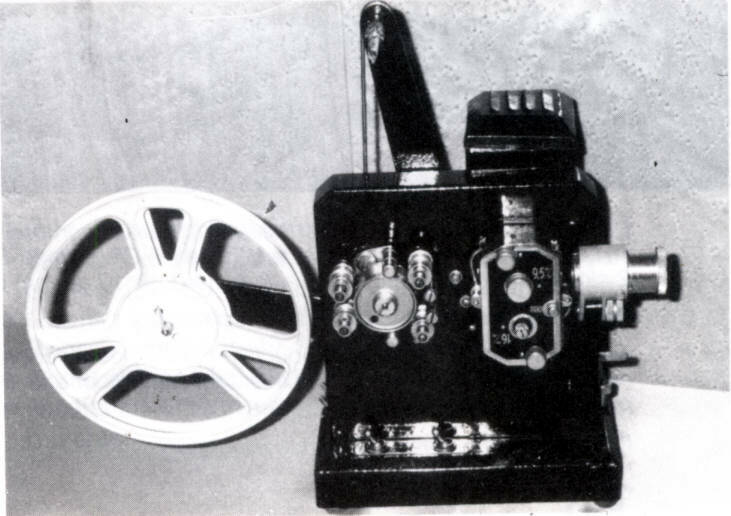 MICKEY MOUSE PROJECTOR - MODEL 'A' - Early 1930s - simple 'toy' - takes 30/60 foot cassettes or 15 foot roll of 9.5mm film. 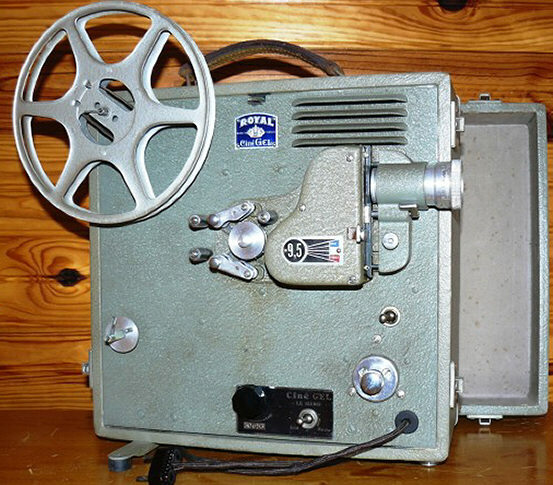 Sold for showing short Disney-Mickey Mouse films. Illumination from mains voltage 40 or 60 watt household lamp bulb. 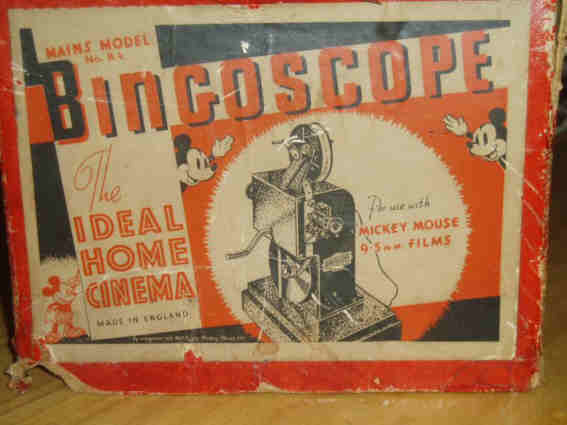 MICKEY MOUSE PROJECTOR - MODEL 'B' - Early 1930s - simple 'toy' - takes 30/60 foot cassettes or 15 foot roll of 9.5mm film. 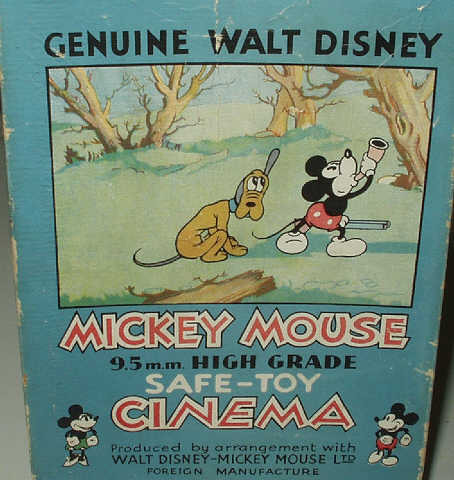 Sold for showing short Disney-Mickey Mouse films. Run from 4.5 volt 'flat' type torch battery. Lovely colour cardboard box has white screen in the side. 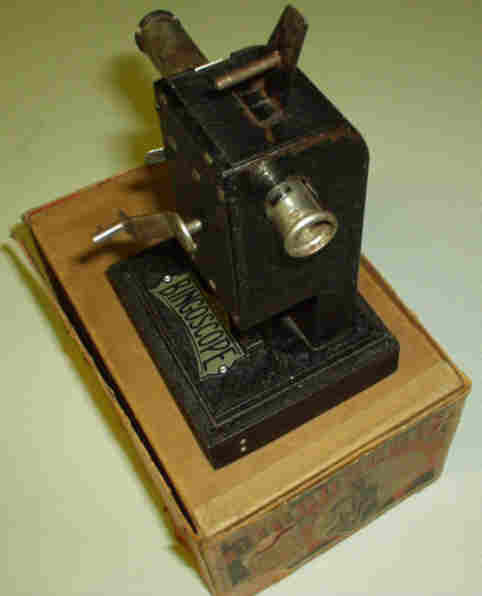 * MICRO CINE VIEWER - SWITZ 193? 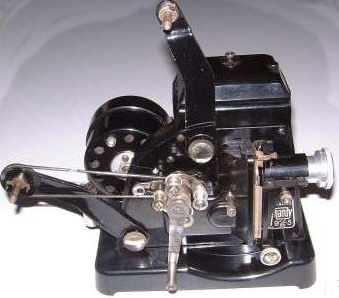 - Black metal box with geneva movement, takes 30ft closed spools - same mechanism as the Presenta! 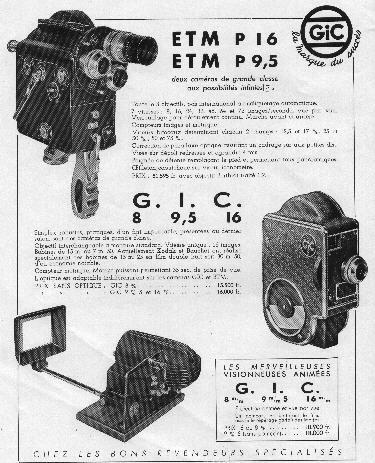 *MIDAS CAMERA/PROJECTOR - GB 1933 - Clever but complicated design, electric drive for filming, powers lamp for hand-turned projection, special 30ft magazine, sprockets, f2.5 lens. 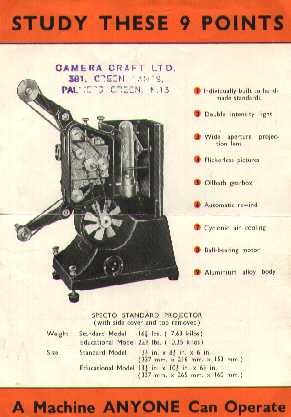 SUPER-MIDAS CAMERA/PROJECTOR - GB 1937 - By 1937 the original Midas was being sold off (by 'John Browning - Scientific Instrument Makers' still using the Bush House address) at 35/- - that is £1.75 - and a modified model advertised which had a dropper resistance for mains use and 300ft spools mounted on a base-board with rollers to feed the film in and out of the camera/projector ..... prices were from £4-15sh-0d (£4.75) - see the ACW December 1937 page 339. 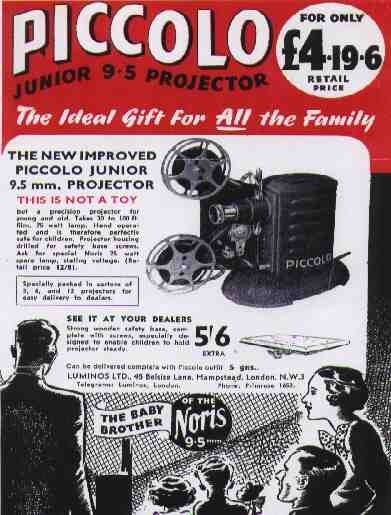 *NORIS JUNIOR PROJECTOR - GER 1952-57 - Blue/green stove finish, sprockets, framing, motor drive, 240v 100w A1/21 B15/s lamp, not blower cooled, f2.5 50mm lens. 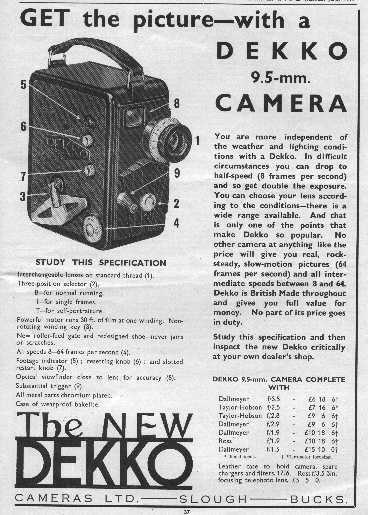 - see ACW review November 1953 - dim picture, no height adjustment, but only £19.19shillings with fibre carry case. 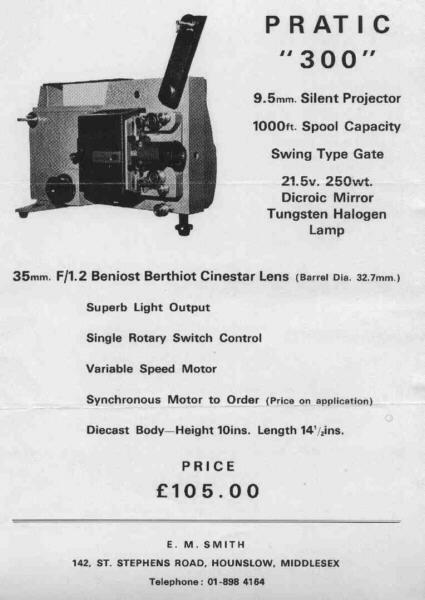 *SPECIAL PEERLESS - GB 1937 - 400ft spools, beta movement, motor driven, sprockets, originally 50 watt lamp, later 200 watt, kits for conversion to 16mm and later 8mm. Soon became "Triplico" from a company in Liverpool - see Triplico below. PROJECT BIEN Project Bien - well that's what the label says! 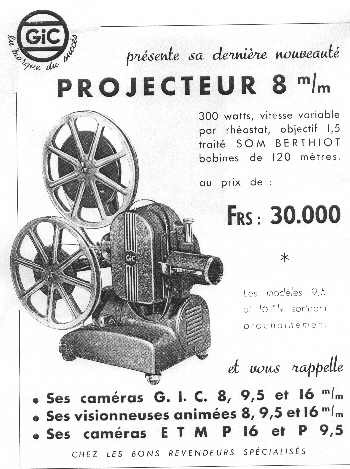 PROJECT BIEN PROJECTOR - FR 1945? 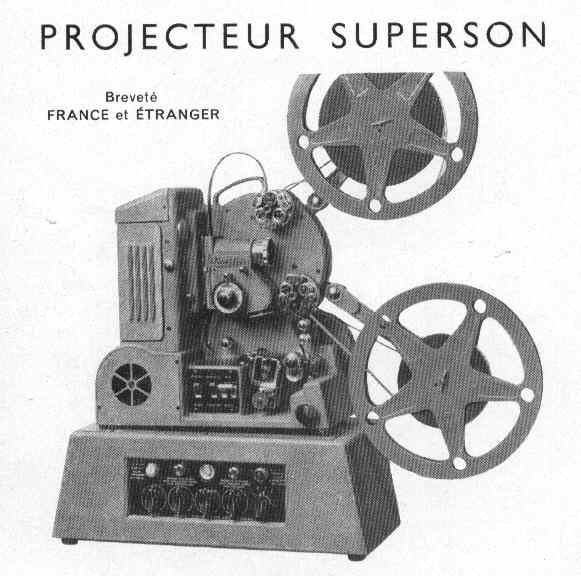 - A simple hand-turned projector with sprocket feed and take-up, takes 400ft spools, 110 volt -the plastic switch suggests post-WW2 - perhaps very early 1950s (France changed to 220 volts in the mid 1950s) The name simply means 'Projects well' in English - can anyone help with more info please? 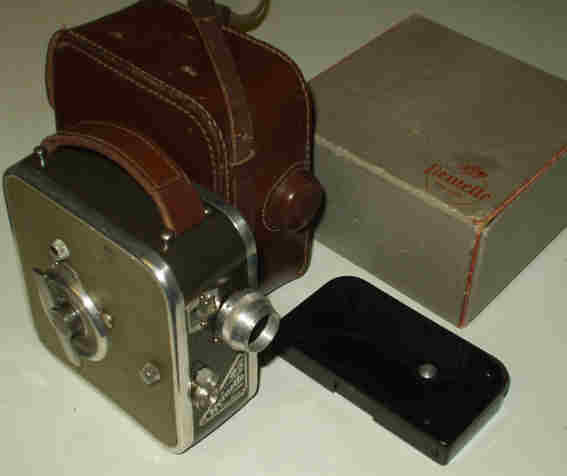 *RADEX TOY PROJECTOR - GB 193? 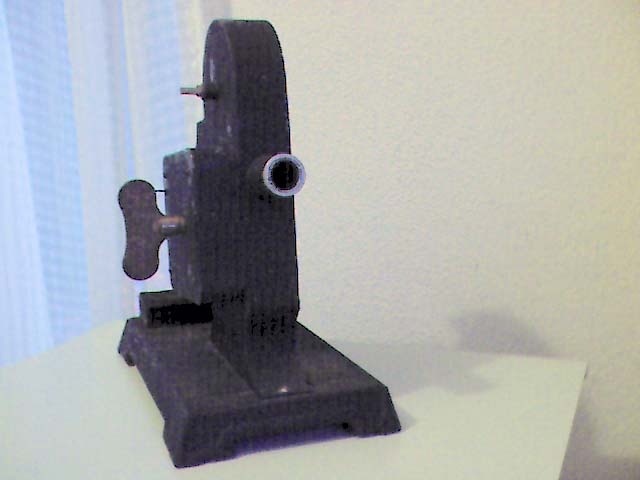 - Tiny, simple pressed steel toy projector. 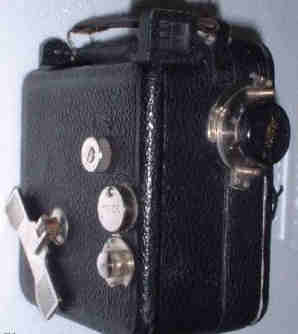 Sold pre-war in Woolworths in 6d parts - film loops only, takes 4.5v 'flat' torch battery. 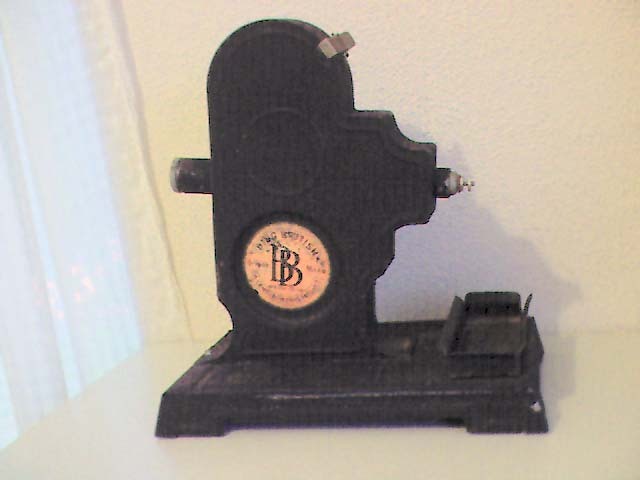 *RAY TOY PROJECTOR - GB 1933? 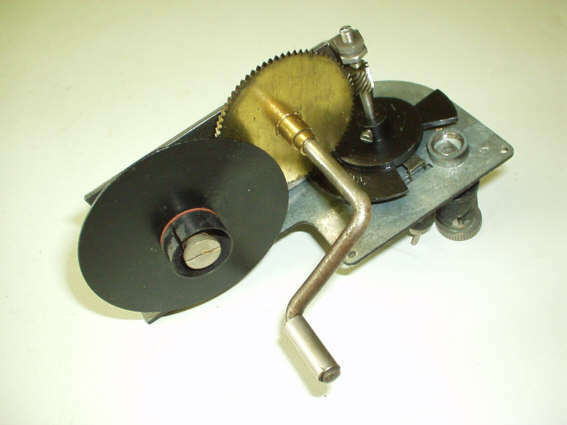 - Simple hand turned with brass gate, external flywheel, integral lamp holder with condenser lens, 30/60ft cassettes. 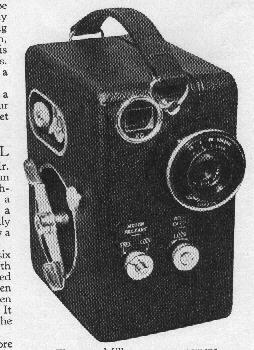 *SCRENUS CAMERA/PROJECTOR - GB 1932 - Small hand turned tin-can! Sold by Gamages for £1.38! charger loading for filming, 30ft cassettes for projection. 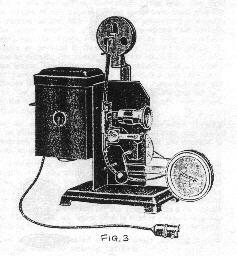 Lens has two waterhouse stops - 'film'/'project'. 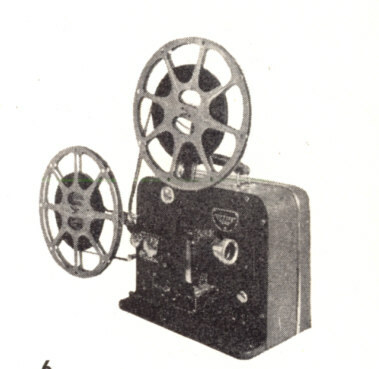 A label in the lid proclaims "British Patent No. 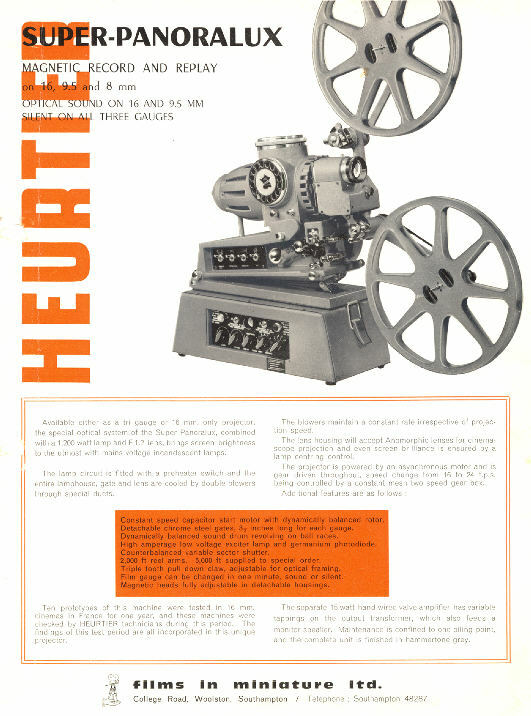 368444 - Patented throughout the World". 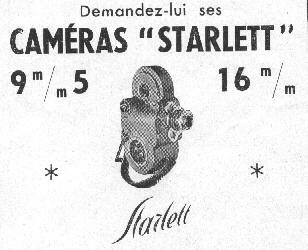 Seems the Screnus company failed soon after the camera/projector arrived, so another company bought the parts and continued assembly, minus the 'Screnus' name - mine is one of these. They are pretty rare. 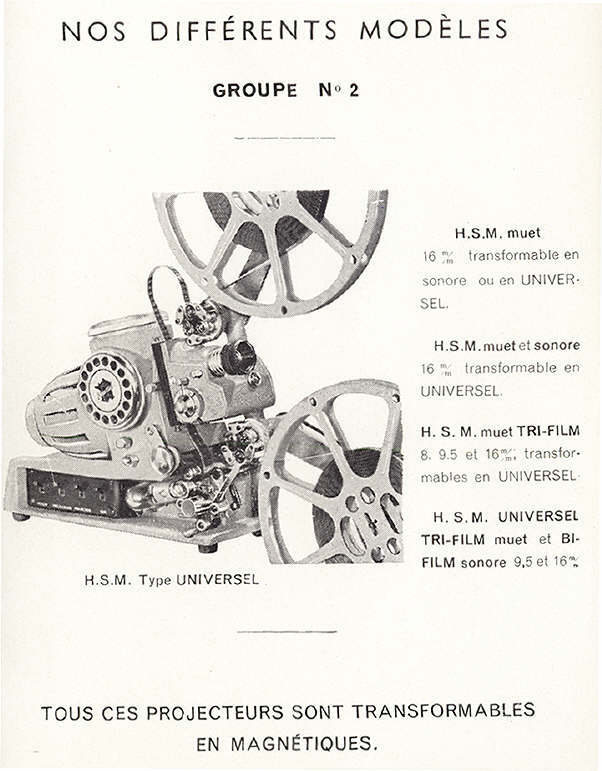 Trevor Adams from NZ tells us that the sales line was "From Scene to Screen in one Machine" - pity the copy writer didn't design the thing! 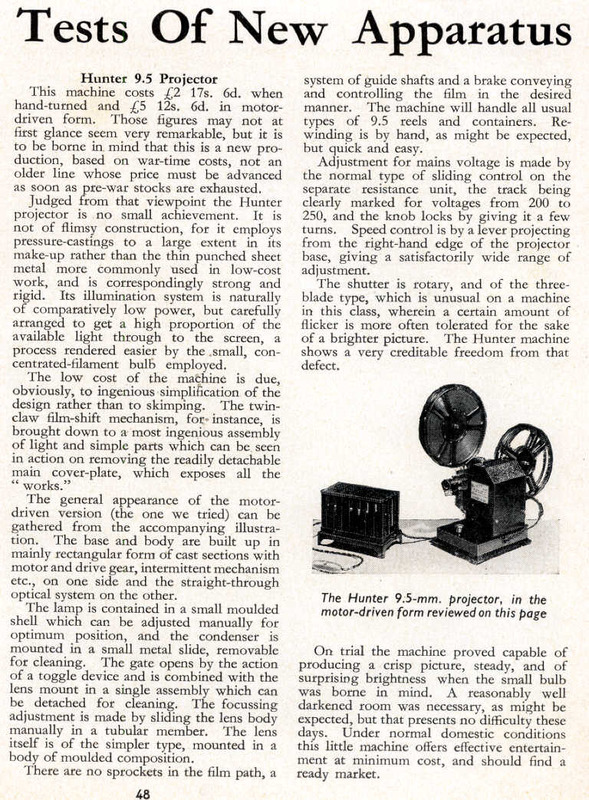 (included in my article Group 9.5 magazine No.89 Spring 1997) Small review in ACW October 1935. 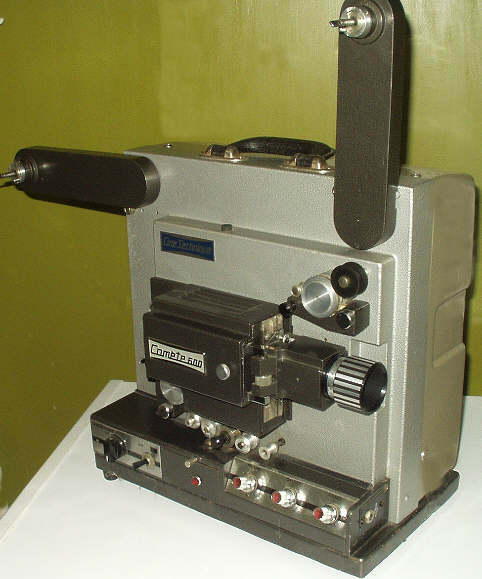 John Lanser from Australia has found an early example and it is called "Screnus" not "Screenus" !! 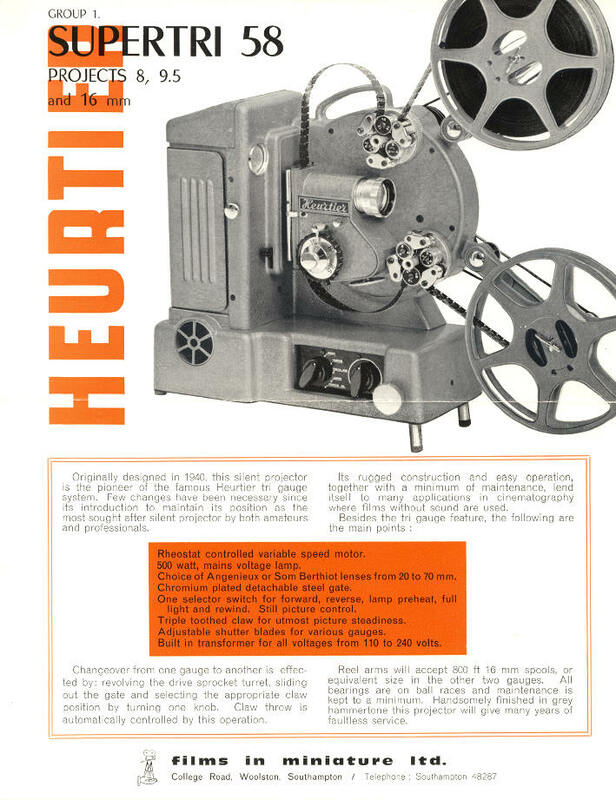 SPECTO LEADER 500 - GB 1960 - Special batch made for 9.5mm specialist dealer D.M. Bentley, as 500 model. 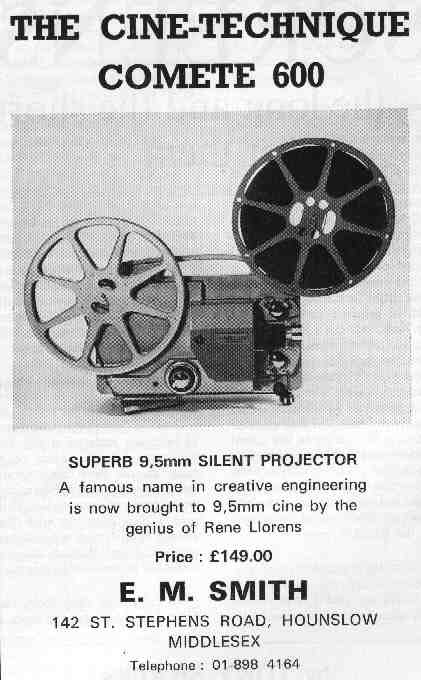 *SUPER-NINEFIVE PROJECTOR - 1979/1980 - 400ft spools (1000ft attachment), f1.4 20-32mm zoom lens, power rewind, A1/17 8volt 50watt lamp, fixed speed 18fps (private UK conversions of the Super 8mm "Plus-O-Matic 202" projector from Raynox of Japan) - typical serial number 504297. I' M STILL ADDING MORE DATA AND PHOTOS WHEN TIME PERMITS! 04December2007-EKS added. 02Feb2008 Siemens added; 11Feb2009 Fex added. May2010 Peerless ref./photo added - thanks Martyn Stevens! 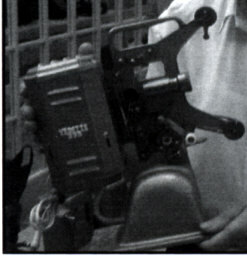 Mar2012 Ditmar article and extra camera info added. 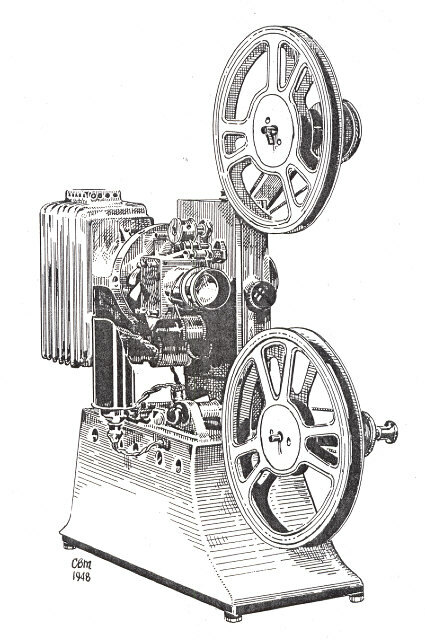 July2012 Astor Cineviser added - thanks Andrew Stacy & his dad! Aug2012 Astor 22 added - thanks Jennie Beadle! Astor 33 added and a few safety notes. 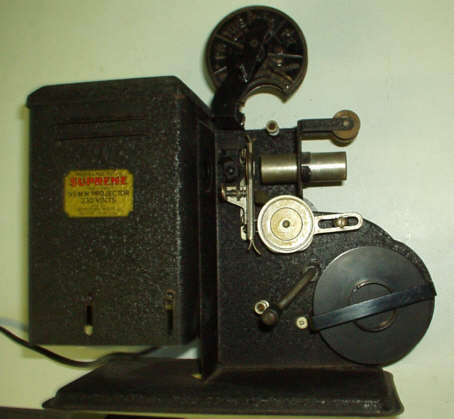 March2013 - Extra Jefe Spanish made projector details added - thanks so much Lluis from Barcelona!